Celetná 12, Prague 1—The Pub Crawl starts in the passage at Celetná 12. 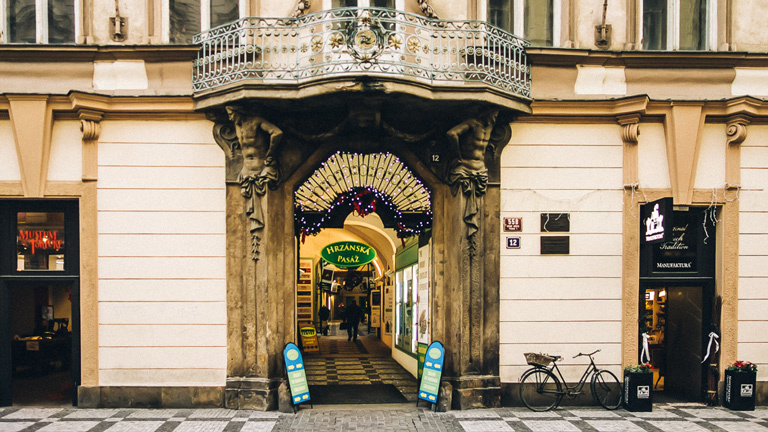 That’s just a few steps from Old Town Square and the Astronomical Clock– sandwiched between the Chocolate Museum and the Torture Museum. Please make sure to get there about 15 minutes ahead of time. It's possible to buy tickets at the meeting point all day. The Ticket Office is open every day from 09:00 to 22:00. If you want to guarantee your spot it is safer to book online in advance. Celetná 12, Prague 1 - Inside this passage. Just speak to one of our promoters (the ones with "Crawl With Me" jackets) on the square, around the clock or on Celetná street; they will be happy to answer questions or take you to the meeting point. If you are looking to party with the Prague Pub Crawl make sure you are with the right crew. Make sure your crawl really starts at Celetná St. 12. All guides and promoters have "CRAWL WITH ME jackets or t-shirts. Promoters working for the competition may tell you all sorts of things to make you go to the wrong party. It's your choice of course but keep in mind that not everyone can be trusted. We don't cheat or lie. We don't water down drinks and you can verify we mean it on our Facebook and TripAdvisor pages.